Cacao Teas: from left to right; damiana honey, cinnamon rose anise, chili allspice, orange hibiscus, vanilla coffee. Cacao is all about togetherness, bonds, success, femininity, fire, warmth, speed and euphoria. When it is combined with the genius of coffee, it becomes stimulating to the senses and mind, when combined with the genius of vanilla, cinnamon, anise and allspice, it draws lust up from the loins of men and women alike. Me and Mr. Jimenez had a blast grinding and sifting all night. Jet and amber blessing; went wild harvesting with my bestie Trish in a cottonwood fluff covered forest, then wen't home and blessed my new jet talismans. 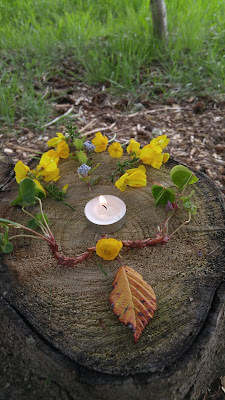 A few days back, before the weather really cheered, D., J.B and I made a flower offering in the local woods, to show our appreciation for the arrival of spring and bees and sun. they're on their way off to see the world!